Building of the framework and ramps. The framework is reused from the old layout in Denmark, and is actually a system to make storage-shelves in warehouses. As this layout is much bigger than the one in Denmark, I've had to use wood for the legs, instead of the metal-frames. In the left picture one can see some kind of bridge under construction. For some reason I completely left out bridges in the original design. How stupid! 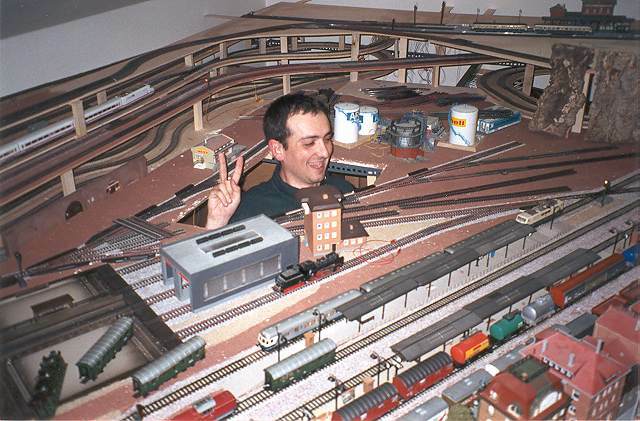 -It's one of the most interesting things with a model railroad layout. Now this bridge is my half-hearted intend to fit in a bridge at a much too late state in the construction. It's far from convincing. The above picture shows the layout with the ramps for the mountain-line installed. Here, up to two trains will work in auto-mode between an end-station and the main station. The trains working in auto-mode is a BR141 with a set of Silberlinges and the accu-triebwagen set 515/815. Along the back-wall one can see the hidden crossing-station that allows the two reversing trains to work simultanously. On the picure one can also see the terrible inclination of the roof. What a shame and waste of possiblities that might otherwise have been realized with a 5x3 meter space! The middle section shows the shifting yeard (the hole in the middle) and the future industrial area. The total lenght of storage-tracks here superceeds 10 meters. In the right corner the double inclined roof again plays havoc on the creativity of the model-builder. No high snowy mountains, nor breathtaking canyons will fit here. The cork is very beautiful, but rather difficult to work with. The layout is now totally covered with cork-pieces, but in teh next layout I dont think I will use it. The happy guy in the picture is not me, but my friend Xabi. Xabi is currently realising just how difficult it is to move around below the layout. (Only 60 cm above the floor). I have a small video-clip available showing a lot of trains running (simultaniously), seen from inside the tunnels, and through the partly done landscape. The file is in RealPlayer format!